The scope of this article is limited to the Pacific Ocean, to the north of the equator between 100°E and the 180th meridian. Within the northwestern Pacific Ocean, there are two separate agencies that assign names to tropical cyclones, which can often result in a cyclone having two names, one from the JMA and one from PAGASA. The Japan Meteorological Agency (JMA) will name a tropical cyclone should it be judged to have 10-minute sustained wind speeds of at least 65 km/h (40 mph) anywhere in the basin, while the Philippine Atmospheric, Geophysical and Astronomical Services Administration (PAGASA) assigns names to tropical cyclones which move into or form as a tropical depression in their area of responsibility located between 135°E and 115°E and between 5°N–25°N regardless of whether or not a tropical cyclone has already been given a name by the JMA. Tropical depressions that are monitored by the United States' Joint Typhoon Warning Center (JTWC) are given a number with a "W" suffix. During the year, several national meteorological services and scientific agencies forecast how many tropical cyclones, tropical storms, and typhoons will form during a season and/or how many tropical cyclones will affect a particular country. These agencies included the Tropical Storm Risk (TSR) Consortium of University College London, PAGASA and Taiwan's Central Weather Bureau. The first forecast of the year was released by PAGASA on January 15, within its seasonal climate outlook for the period January–June. The outlook noted that one to three tropical cyclones were expected between January and March, while two to four were expected to develop or enter the Philippine Area of Responsibility between April and June. PAGASA also mentioned that the La Niña would be short-lived, predicting that it would last until February or April. On March 15, the Vietnamese National Center for Hydro Meteorological forecasts (VNCHMF) predicted that roughly twelve to thirteen tropical cyclones would affect Vietnam during 2018, which is above average. On March 23, the Hong Kong Observatory predicted that five to eight tropical cyclones would come within 500 kilometres of Hong Kong, which is normal to above normal, with the first tropical cyclone affecting Hong Kong in June or earlier. On May 11, the Tropical Storm Risk (TSR) issued their first forecast for the season, predicting that the 2018 season would be a slightly above average season producing 27 named storms, 17 typhoons, and nine intense typhoons. The TSR released their second forecast on July 6, still predicting that the season will be an above average with the only changes to their forecast is increasing the number of intense typhoons from 9 to 10. The PAGASA issued their second and final outlook on July 13, predicting for the period of July – December, where six to eight tropical cyclones were expected to develop or entered their area of responsibility between July and September, while four to six were forecast during October to December. On August 7, TSR released their final forecast, with its only changes decreasing the numbers of intense typhoons from 10 to 9, as well as decreasing its ACE forecast from 331 units to 319 units. 2018 opened with Tropical Depression Agaton active to the east of the Philippines. Over the course of two days, the system moved over to the South China Sea and intensified into the first named storm, Bolaven. A month later, Tropical Storm Sanba developed and affected the southern Philippines. About another month later, Tropical Depression 03W formed in the open Pacific and was named Jelawat. Jelawat intensified into the season's first typhoon on March 30, and then the season's first super typhoon. Tropical activity fired up by June, when a series of storms developed, with Tropical Storm Ewiniar making landfall over mainland China. Later that month, Typhoon Prapiroon developed and affected the Korean Peninsula, the first since 2013. Thereafter, Typhoon Maria developed and reached its peak intensity as a Category 5 super typhoon, being the first typhoon to reach that intensity since Typhoon Nock-ten in 2016. 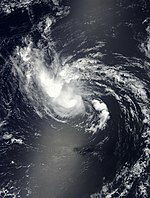 Hurricane Hector crossed the International Date Line on August 13, the first to do so since Genevieve in 2014. Systems like Tropical Storms Son-tinh, Ampil, Josie, Wukong, Jongdari, Shanshan, Yagi, Leepi, Bebinca, and Rumbia formed between late July to early August. 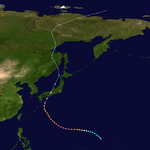 On August 16, Typhoon Soulik developed and headed north, until a Fujiwhara interaction with Typhoon Cimaron (which formed later than Soulik) made it head west towards the East China Sea. It later made landfall in South Korea, making it the first typhoon to make landfall in South Korea since Typhoon Chaba in 2016. Cimaron made landfall near Kyoto, Japan on August 23. When Cimaron was nearing landfall, Tropical Depression Luis formed, which made landfall in China and Taiwan. Later that month, Typhoon Jebi developed over the West Pacific and intensified into the third super typhoon of the season. In September, Typhoon Mangkhut became the fourth super typhoon of the season and made landfall on the island of Luzon in the Philippines. 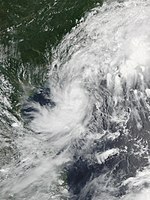 On the same day, Tropical Depression Neneng formed, which later became Tropical Storm Barijat and made landfall in Vietnam. By late September, Typhoon Trami (Paeng) formed, becoming the 5th super typhoon of 2018. While Typhoon Trami was in the Western Pacific, nearing Okinawa with winds of 165 km/h (105 mph), Tropical Depression 30W formed, and was named Kong-rey by the JMA after strengthening into a tropical storm. It intensified into a super typhoon on October 2, becoming the 5th Category 5 super typhoon. 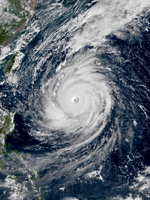 Later on in the month, it was followed by the sixth and final Category 5-equivalent storm of the season, Yutu. A low-pressure area developed into a tropical depression northeast of Palau on December 29, 2017. The system moved generally westward and on the first day of 2018, the PAGASA began issuing advisories on the system and locally named it Agaton. Both the JMA and the JTWC followed suit, with the latter designating the system as 01W. By January 3, the system had intensified into a tropical storm according to the JMA and was named Bolaven, thus becoming the first named storm of the season. However, several hours later, Bolaven started to weaken and rapidly deteriorate. The system was last tracked by the JMA to the east of Vietnam on January 4. The impact caused by Bolaven (Agaton) was moderate but not as significant as the previous two systems, Kai-tak and Tembin, with about 2,000 passengers stranded in ports in the Visayas. As of January 22, three people have been reported killed by the storm, while total damages were up to Ph₱554.7 million (US$11.1 million). 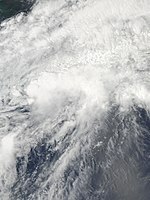 A low-pressure system developed into a tropical depression north of Chuuk early on February 8. 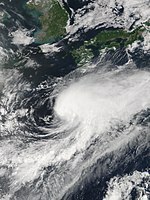 It developed into a tropical storm on February 11, receiving the international name Sanba by the JMA. Shortly afterwards, Sanba entered the Philippine area of responsibility and received the name Basyang by PAGASA. On February 13, Sanba made landfall in Cortes, Philippines, causing it to weaken to a tropical depression. The next day, the system weakened into a remnant low as it made another landfall in Surigao del Sur. Approximately 17,000 people were affected by the storm and there were 14 fatalities. Total agricultural damages were at Php 168 million (US$3.23 million). On March 24, a tropical depression formed to the south of the Mariana Islands, and the JTWC assigned it the numerical identifier 03W. On March 25, the system intensified into a tropical storm and was named Jelawat by the JMA. Due to strong southwesterly wind shear, the cyclone remained poorly organized, with disorganized convection near an exposed low-level circulation. Conditions gradually became more favorable for further development, resulting in Jelawat steadily strengthening and organization to a severe tropical storm at 18:00 UTC on March 28. Later on March 29, an eye began to emerge within a growing central dense overcast, leading to the JMA classifying it as a typhoon at 00:00 UTC on March 29. Explosive intensification then ensued over the following 36 hours as the eye became sharply defined, and Jelawat attained its peak intensity later that morning, with estimated 10-minute sustained winds of 195 km/h (120 mph) and a central pressure of 915 hPa (27.02 inHg). At the same time, the JTWC assessed it as peaking with 1-minute sustained winds of 240 km/h (150 mph), making it a Category 4 super typhoon. Immediately after peaking in intensity, Jelawat began weakening rapidly, due to a sharp increase in wind shear and dry air, and the storm fell below typhoon strength late on March 31. During the next couple of days, Jelawat drifted to the northeast, and then turned eastward, before dissipating on April 1. A low-pressure area east of Mariana Islands was upgraded to a tropical depression by the JMA late on May 10, shortly before the JTWC issued a TCFA. By May 12, deep convection was observed near its center as the JTWC began issuing advisories on the system giving the designation 04W. Roughly twelve hours later, it was reported that 04W had intensified into a tropical storm by the JTWC after satellite imagery had depicted on a well-defined center. Tracking in a course of a west-northwesterly direction, the system began to weaken as it started entering in an area of unfavorable conditions. Therefore, 04W rapidly weakened as the JTWC issued their final advisory on the system early on May 14, as the system showed a very elongated and exposed center, due to very strong wind shear. The JMA, however, tracked the system until early on May 15, when it finally dissipated. A low-pressure area developed into a tropical depression over the South China Sea on June 2. Later that day the JTWC followed suit and designated the system as 05W. 05W meandered in a westward direction until it curved northward and after three days, the JTWC upgraded the system to a tropical storm. The JMA did the same three hours later early on June 6, naming it Ewiniar. Shortly thereafter, Ewiniar made landfall over South China. Ewiniar maintained its intensity while over land until the JTWC issued its final advisory late on June 7. 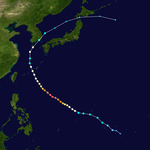 The JMA, however, tracked the system until early on June 9, when Ewiniar had weakened into a tropical depression and degenerated into a remnant low. However, Ewiniar's remnant moved out to sea and continued to persist, before dissipating on June 13. A total of 13 people were killed, while total damages in Mainland China were counted to be ¥5.19 billion (US$812 million). A low-pressure area northwest of Palau developed into a tropical depression late on June 3. On the next day, the system received the name Domeng from PAGASA, while the JTWC issued a TCFA for the system. After the system had consolidated further, the JMA finally upgraded the system to a tropical storm, naming it Maliksi. The JTWC, however, didn't track the system until 03:00 UTC of June 8 when it also gave the designation 06W. Moving northward, Maliksi continued to intensify until it reached its peak strength early on June 10 with winds of 110 km/h (70 mph), just shy of typhoon intensity, and a minimum pressure of 970 hPa. Operationally, the JMA briefly classified Maliksi to a typhoon, but was downgraded to a severe tropical storm in post-analysis. Afterwards, Maliksi began to weaken as it begins its extratropical transition. Encounting unfavorable environments by June 11, both agencies immediately stopped warning on the system as the system's center became exposed as the system was declared as an extratropical cyclone. The JMA had tracked the remnants of Maliksi until 00:00 UTC of June 13. Despite not making landfall in the Philippines, Maliksi prompted the PAGASA to declare the official start of the rainy season on June 8, 2018. Two people were killed by heavy monsoonal rains, enhanced by Maliksi, in the Philippines. A disturbance formed southwest of Taiwan on June 12, just within the meiyu front, and the JTWC indicated a subtropical depression subsequently. By 21:00 UTC of June 13, the JTWC issued its first advisory on the system, designating it as 07W, and was classified as a tropical depression. Despite located in a moderately to severely sheared environment, the system was located over in relatively warm sea-surface temperatures with patches of convection, and this prompted the JTWC to upgrade 07W to a tropical storm. The JTWC later issued their fourth but final advisory on 07W on 15:00 UTC of June 14, when the system was rapidly undergoing a phase of extratropical transition as the system was losing its structure rapidly. 07W fully became an extratropical cyclone just to the south of mainland Japan on 06:00 UTC of June 15, although its remnant was still tracked until June 25, when the system was last located near the coast of British Columbia. In JMA's post-analysis, 07W was marked as a tropical low and was first monitored on June 14. 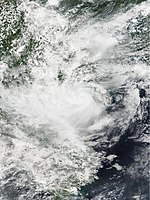 On June 13, a tropical depression formed on the South China Sea, from Tropical Storm 07W's trough. On June 14, the PAGASA announced it had entered the Philippine Area of Responsibility, assigning the name Ester. Tropical Depression Ester (08W) made landfall on Taiwan by midnight, and after emerging off the coast and intensifying into a tropical storm, it had been assigned the name Gaemi by the JMA. On June 16, Gaemi became extratropical. On June 19, the NDRRMC reported that 3 people had died from monsoonal rains enhanced by Gaemi. Agricultural damage in Okinawa Prefecture were about ¥84.58 million (US$764,000). A low-pressure area west of Okinotorishima developed into a tropical depression on June 28. On the next day, PAGASA began issuing advories, giving the name Florita. 6 hours later, Florita became a tropical storm, with JMA assigning Prapiroon for the international name. 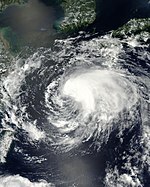 On June 30, Prapiroon began to intensify into a tropical storm. By July 2, Prapiroon became a Category 1 Typhoon, nearing Japan and Korea. By July 3, Typhoon Prapiroon had attained peak intensity. On the same day, Prapiroon made landfall on Japan. After landfall, Prapiroon briefly weakened to a tropical storm. Prapiroon became a low-pressure area on the next day, though the JMA still tracked its remnants until July 10, when it finally dissipated. As of July 2018[update], 1 person from South Korea was killed by the storm. Agricultural damage in Okinawa Prefecture were about ¥49.39 million (US$446,000). A tropical depression formed on July 3. On the next day, the system intensified into Tropical Storm Maria. Early on July 5, Maria intensified into a severe tropical storm, while the JTWC classified the system as a Category 1 typhoon. Explosive intensification ensued, and later that day, Maria became a super typhoon and the first Category 5-equivalent storm of this basin since Nock-ten in 2016. Shortly afterwards, Maria underwent an eyewall replacement cycle, and it weakened below super typhoon status the following day. By July 8, however, Maria had completed the eyewall replacement cycle and regained Category 5-equivalent intensity. It then made landfall in East China on July 10 as a Category 2 storm after soaking Southern Japan and killed 1 people, while total damages in Mainland China were counted to be CN¥4.16 billion (US$623 million). An area of low-pressure strengthened into a tropical depression on July 15, to the northwest of Manila, Philippines. The JTWC designated it as 11W while the PAGASA named it Henry. As the system moved in a fast westward direction, the system gradually intensified and was declared a tropical storm by July 17, with the JMA naming it as Son-Tinh as its convective structure improved. Although from thereafter, Son-Tinh slightly weakened as it neared Hainan island while experiencing moderate shear. During the next day, however, Son-Tinh slightly intensified over in the Gulf of Tonkin due to warm sea-surface temperatures before it made landfall in northern Vietnam. Both agencies issued their final warning on Son-Tinh on July 19 as the system had weakened back into an area of low-pressure embedded by the monsoon. However, the JTWC continued to track the system's remnant low for another two days, before it finally dissipated. On July 17, a weak tropical depression had developed over in the Philippine Sea. With some deep convection and the system located in favorable environments, the JTWC began tracking on the system, designating it as 12W. By the next day, the PAGASA followed suit and was locally named as Inday. By 12:00 UTC of July 18, the system had intensified into a tropical storm and was named Ampil. As Ampil moved in a northward direction, the system's structure had broadened along with sustained deep convection. Despite an unfavorable ocean heat content, Ampil still remained over relatively warm sea-surfaces temperatures with the inclusion of an extensive deep convection, therefore Ampil was classified as a severe tropical storm. With an improved convective system, the JTWC assessed that Ampil had reached 1-minute peak winds of 95 km/h (60 mph). Ampil reached its peak intensity with a minimum pressure of 985 hPa and maintained that intensity for the next few days, despite with the change of direction. On July 21, the system's center became exposed as the system slightly weakened. By the next day, the JMA downgraded Ampil back to a tropical storm, as the system made landfall over China with a lack of convection. Ampil weakened further to a tropical depression on July 23, and both agencies issued their final advisory on the system. The JMA continued tracking the system until it weakened into an area of low pressure, at 18:00 UTC on July 24. Heavy rain in Shandong Province—accumulating to 237 mm (9.3 in) in Tianjin—caused significant flooding, inundating 31,600 hectares of crops and affecting 260,000 people. One person was killed in China and total economic losses reached CN¥1.63 billion (US$241 million). A tropical depression formed on the South China Sea on July 20, according to the JMA. On July 21, the system entered the PAGASA's Philippine Area of Responsibility or PAR, and was named Tropical Depression Josie, the 10th named storm to enter the PAR this season. Tropical Depression Josie (13W) missed kilometers off of landfall in Saud, Ilocos Norte. It moved north, and exited the PAR by the next day. While approaching China, 13W is about to become a named tropical storm, but missed tropical storm strength and was destroyed by high wind shear near China. The remnants of 13W headed inland to mainland China, where it fully dissipated. Since the formation of the previous two systems, the southwest monsoon had been extremely active in the Philippines. By August 1, a total of 16 people had been killed due to extreme flooding, while damages have been recorded at ₱4.66 billion (US$87.4 million). The southwest monsoon had been active since Typhoon Maria. July had 5 days of class suspensions in Metro Manila, second in history since Typhoon Ketsana struck Metro Manila and caused ocean-high flooding since 2009. Late on July 21, the JTWC began to issue advisories on Tropical Depression 14W that had developed about 603 km (381 mi) east-southeast of the Japanese island of Minami-Tori-shima. The JMA, however, began tracking the system until the early hours of July 22. Later that day, the JTWC upgraded 14W to a tropical storm, despite the fact that convection had been sheared and the system was located in unfavorable southwesterly shear. Within the next 24 hours, 14W began to organize with deep convection obscuring its LLCC, and on 12:00 UTC of July 23, the JMA upgraded the system to a tropical storm, naming it Wukong. Moving poleward, Wukong gradually intensified while entering in an area of favorable environment with lesser shear and on 00:00 UTC of July 25, the JMA upgraded Wukong to a severe tropical storm. Nine hours later, the JTWC upgraded Wukong to a Category 1 typhoon after satellite images depicted a 30-nmi ragged eye. Though by July 26, both the JMA and the JTWC issued their final advisory on Wukong as the system had rapidly transitioned into an extratropical cyclone. Wukong's extratropical remnants was tracked until late on July 27 when it was last noticed off the eastern coast of Russia Far East. A tropical disturbance formed southeast of Guam on July 19 and tracked westward steadily. After issuing a Tropical Cyclone Formation Alert on July 21, the Joint Typhoon Warning Center (JTWC) upgraded the system to a tropical depression early on July 22, although the location of its low-level circulation center was not clear. The Japan Meteorological Agency (JMA), however, kept reporting it as a low-pressure area until it was upgraded to a tropical depression late on July 23. After the slow consolidation for several days, the system was upgraded to a tropical storm near Okinotorishima at around 18:00 on July 24 by agencies such as JMA and JTWC, with an international name Jongdari. A microwave imagery revealed a low-level forming eyewall next day, indicating a consolidating system. After JMA upgraded Jongdari to a severe tropical storm at noon, the system accelerated northeastward under the influence of a near-equatorial ridge to the south. On July 26, as Jongdari started to interact with an upper-level cold-core low to the north which significantly enhanced poleward outflow, it intensified to a typhoon in the afternoon despite increasingly unfavorable vertical wind shear. Over the warm sea surface temperatures between 29 to 30 °C (84 to 86 °F) near the Ogasawara Islands, JMA reported that Jongdari had reached peak intensity at 00:00 UTC on July 27, with ten-minute maximum sustained winds of 140 km/h (85 mph), and a minimum central pressure of 965 hPa (28.50 inHg). Although JTWC indicated Jongdari reached peak intensity at 12:00 UTC with one-minute maximum sustained winds of 175 km/h (110 mph), the rugged eye of Jongdari kept periodically visible with an elongated structure due to the further interaction of the upper-level low which had moved to the northwest side of the typhoon. As the steering influence transitioned to a subtropical ridge to the northeast, Jongdari executed a counter-clockwise turn to the southeast of Japan. Jongdari began to be inundated by subsidence on July 28, as the Fujiwhara effect had made the upper-level low move to the west of the typhoon. It also initiated a weakening trend while accelerating northwestward and then westward toward the Japanese island of Honshu. At around 01:00 JST on July 29 (16:00 UTC July 28), Typhoon Jongdari made landfall over Ise, Mie Prefecture with ten-minute maximum sustained winds at 120 km/h (75 mph) and the central pressure at 975 hPa (28.79 inHg). The storm weakened rapidly inland and made its second landfall over Buzen, Fukuoka Prefecture, at around 17:30 JST (08:30 UTC), with ten-minute sustained winds of 75 km/h (45 mph) and a central pressure of 992 hPa (29.29 inHg). At around 10:30 CST (02:30 UTC) on August 3, Tropical Storm Jongdari made landfall over Jinshan District, Shanghai. Jongdari rapidly weakened after landfall, dissipating on the next day. No fatalities were recorded for this storm. A tropical disturbance developed about 807 km (503 mi) north-northeast of Iwo To by July 29. The JTWC upgraded the system to Tropical Depression 16W during the next day after its convective structure had slightly improved despite the system located in moderate to strong wind shear. By July 31, the JMA followed suit on classifying the system as a tropical depression. 16W's center late became exposed with deep convection displaced due to continued shear. Originally, the system was forecast to reach tropical storm intensity with only 35 knot winds, but the system's center had become asymmetric with a fully sheared center. The JTWC issued their final advisory on 21:00 UTC of the same day, after 16W had fully transitioned into a subtropical cyclone, though both agencies continued to track the system until August 2. A tropical depression had developed to the east-northeast of Guam on August 2. On 21:00 UTC of the same day, the JTWC began tracking the system, giving the identifier 17W. 17W intensified into a tropical storm on August 3, with the JMA naming it as Shanshan. The storm was located over in favorable environments as the system was gradually consolidating, therefore Shanshan intensified into a severe tropical storm. During the next day, both the JMA and JTWC upgraded Shanshan to a typhoon after deep convection was seen wrapping into its developing center. The JMA later analysed that the storm had reached 10-minute winds of 130 km/h (80 mph) and a minimum pressure of 970 hPa, and remain that intensity for several days. Though the JTWC stated that Shanshan had slightly weakened after a strengthening trend by August 6 after its eye became ragged and slightly displaced. However, on August 7, Shanshan began to re-intensify and reached its peak strength as a Category 2 typhoon with 1-minute winds of 165 km/h (105 mph) while nearing the coast of southeastern Japan. Thereafter, Shanshan began to change its course towards the east as it rapidly weakened. The JTWC issued their final advisory on August 9, though the JMA tracked the system until it became extratropical at 06:00 UTC on August 10. Infrastructural and agricultural loss in Miyagi Prefecture were at ¥14.66 million (US$132,000). A tropical disturbance had persisted towards the southwest of Iwo To on August 1. After the course of five days, the system finally strengthened into a tropical depression by the JMA, with the JTWC following suit several hours later (designating it as 18W). The PAGASA also began issuing bulletins to the system, locally assigning the name Karding. Karding maintained its intensity as a tropical depression due to moderate to strong easterly shear, despite persistent convection surrounding the system. By August 8, a METOP-A ASCAT image showed that the system had winds of 35 knots, hence the JTWC upgrading it to a tropical storm. The JMA around the same time did the same, naming it Yagi. Within the next day, Yagi curved towards the northwest while continuously battling shear as it struggled to intensify. 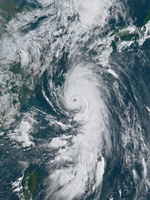 Though by 12:00 UTC of August 11, the JMA considered that Yagi reached its peak strength with 10-minute winds of 75 km/h (45 mph) and a minimum pressure of 990 hPa. The JTWC declared that Yagi reached winds of 85 km/h (50 mph) on 12:00 UTC of August 12 after the storm had consolidated further with an improved structure. Yagi made landfall shortly thereafter over Wenling, in Taizhou of Zhejiang, China, at around 23:35 CST (15:35 UTC) on August 12. By 21:00 UTC of that day, the JTWC issued their final advisory on Yagi, but continued to track it until it weakened further into a tropical depression early on August 13. The JMA did the same on 06:00 UTC of August 13, but continued to tracked it until it became an extratropical system on August 15. Although Yagi (Karding) didn't make landfall in the Philippines, the storm enhanced the southwest monsoon which brought extreme flooding towards many regions within the country. According to the NDRRMC, 5 people died along with ₱996 million (US$19 million) worth of damages. In East China, Yagi killed a total of 3 people and total damages were counted to be CN¥2.51 billion (US$367 million). On August 9, a tropical depression formed within the South China Sea. The system remained weak and remained stationary for a few days until the JTWC began tracking on the system, designating it as 20W on August 12. By August 13, the JMA finally upgraded the system to a tropical storm, naming it Bebinca. The JTWC followed suit nine hours later when they found flaring deep convection near its compact center. Despite consistent convection along with warm sea-surface temperatures, Bebinca remain weak for the next few days due to strong shear. Although by August 16, Bebinca began to undergo a phase of rapid intensification as its center was obscured by a central dense overcast, and thus, the JMA briefly upgraded Bebinca to a severe tropical storm. The JTWC analysed a few hours later that the system had reached peak intensity with 1-minute winds of 110 km/h (70 mph). After Bebinca made landfall, the system rapidly weakened and both agencies issued their final warning on August 17, and fully dissipated that same day. Bebinca killed a total of 6 people and total economic losses in South China were counted to be ¥2.31 billion (US$333 million). 13 people lost their lives in Vietnam and total damages were counted to be ₫786.55 billion (US$33.7 million). 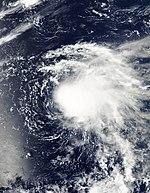 On August 11, a tropical depression became Tropical Storm Leepi the next day. By August 13, Tropical Storm Leepi threatened Japan. By August 14, Leepi became a severe tropical storm or a Category 1 typhoon for JTWC. 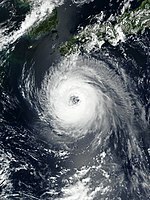 Shortly before 03:00 JST (18:00 UTC) on August 15, Leepi made landfall over Hyūga, Miyazaki in Japan. It finally dissipated on August 15 as an extratropical system with no more energy left. Still, its remnants still headed out to mainland Russia. Leepi dissipated on August 16, after the system was last tracked east of South Korea as a remnant low. On August 13 at 18:00 UTC, both the JMA and the JTWC declared that Tropical Storm Hector from the East Pacific basin had crossed the International Date Line and entered the West Pacific basin. At this point, Hector was still located in a favorable environment with only moderate shear, though deep convection was limited as it only persisted just near its center. Due to an upper tropospheric trough cell located to the west of Hector, the storm failed to intensify and began to weaken. The JTWC downgraded Hector to a tropical depression after the system rapidly entered an area of high vertical wind shear. By the early hours of August 15, both agencies issued their final warning on Hector, mentioning that Hector's low-level circulation had become elongated and that the storm already transitioned into a subtropical cyclone. The JMA, however, continued to monitor the system until 00:00 UTC on August 17. On August 15, a tropical depression in the East China Sea strengthened into Tropical Storm Rumbia. Shortly after reaching peak intensity over the Hangzhou Bay on August 16, Rumbia made landfall over Pudong New Area, Shanghai, China at around 04:05 CST on August 17 (20:05 UTC), becoming the third tropical storm to hit Shanghai in 2018. Rumbia killed a total of 53 people in East China and total economic losses were counted to be CN¥36.91 billion (US$5.36 billion). Shouguang received 174.7 mm (6.88 in) of rain and was particularly hard-hit, with 10,000 homes destroyed and 13 people killed. The city is regarded as the nation's greatest producer of vegetables and agriculture suffered tremendous losses; 200,000 greenhouses sustained damage. Upstream on the Mi River rainfall reached 241.6 mm (9.51 in) and caused significant flooding. Water levels at three reservoirs rose dangerously high, prompting officials to release excess water to avoid collapse. The resulting increase downstream exacerbated the flooding in Shouguang. The extratropical remnants of Rumbia was last tracked northeast of Hokkaido before finally dissipating off the coast of the Russian Far East. A low-pressure area in the Philippine Sea organized into a tropical depression late on August 15. The JTWC followed suit at 00:00 UTC at August 16 and was designated as 22W. Later on that day, the JMA upgraded 22W to tropical storm and it was given the international name Soulik. On August 17, JMA upgraded Soulik to a typhoon, marking the sixth typhoon of the season. Then Soulik rapidly intensified onto a severe typhoon, and on the next day, Soulik reached its peak intensity, with winds of 165 km/h (103 mph), and remained that intensity for several days. After passing the Ryukyu Islands early on 22 August, the storm gradually weakened due to low sea-surface temperatures. On August 23, Soulik made landfall over Haenam County, South Jeolla Province of South Korea at around 23:00 KST (14:00 UTC). Damage in Jeju were about ₩5.22 billion (US$4.64 million). Economic loss in Northeast China were counted to be CN￥550 million (US$79.9 million). Flooding in North Korea triggered by Soulik killed 86 people. On August 16, a tropical depression formed near the Marshall Islands. It was named Tropical Storm Cimaron a day later. Severe Tropical Storm Cimaron rapidly intensified over the course from August 18–22. Typhoon Cimaron threatened Southern Japan, right after Typhon Soulik ravaged the area. Typhoon Cimaron peaked to a Category 3 major typhoon just right before its intense landfall in Japan. On August 23, Cimaron made landfall over the southern part of Tokushima Prefecture, Japan at around 21:00 JST (12:00 UTC). Typhoon Cimaron became Tropical Depression Cimaron before becoming extratropical and headed to the part of mainland Russia as nothing but just a weak low pressure remnant area that as once the devastating storm, Typhoon Cimaron. Cimaron was a significant Category 3 storm, and the 12th typhoon to strike Japan in 2018 and was surpassed by Typhoon Jebi a month later. Then, it made landfall over Himeji, Hyōgo Prefecture shortly before 24:00 JST (15:00 UTC). Agricultural damage in Kyoto, Wakayama and Shiga Prefecture were about JP¥3.41 billion (US$30.6 million). A tropical depression formed at the South China Sea near Taiwan. Despite entering an area of high wind shear, the system was in a favorable environment, so the JTWC and the PAGASA followed suit, with the JTWC naming it 24W, and the PAGASA named it Luis. 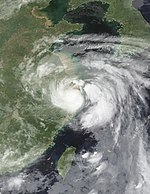 24W then made landfall over Fujian, China shortly after 08:00 CST (00:00 UTC) on August 25, and degenerated into a low-pressure area on next day. The JMA would continue monitoring the system until the next day. Tropical Depression 24W killed 7 people and damages of NT$1.022 billion(US$34 million)in Taiwan. A low-pressure system formed near the Marshall Islands on early August 25, developing and being upgraded to a tropical depression on August 27 by the Japan Meteorological Agency (JMA). There was a persistent deep convection in the system which lead to the upgrade to a tropical storm by the JMA and was given the name 'Jebi'. On August 29, the storm abruptly underwent rapid intensification and became the third super typhoon and the second category 5 of the season. On September 4, a weakened but still powerful Jebi made landfall over the southern part of Tokushima Prefecture at around 12:00 JST (03:00 UTC) before moving over Osaka Bay and making another landfall at around Kobe, Hyōgo Prefecture at around 14:00 JST (05:00 UTC). Osaka was hit badly with a maximum wind gust of 209 km/h recorded at Kansai International Airport and 171 km/h at Osaka city's weather station, where the minimum sea level pressure (962 mb) was the lowest since 1961's record of 937 mb (Typhoon Nancy) and the fifth lowest on record. A 3.29 metre storm surge led to flooding along the Osaka Bay, including Kansai International Airport, where the runways were flooded and some airport facilities were damaged by wind and water. Osaka's iconic Universal Studios Japan was also closed during the event of the typhoon. Wakayama also recorded a maximum wind gust of 207 km/h. Typhoon Jebi then moved over Kyoto which wrecked more havoc. Multiple shrines were closed during the duration of the typhoon. Kyoto Station received a lot of damage, the glass above the atrium covering the central exit, shops and hotel, collapsed, narrowly missing a few by centimeters. The typhoon ultimately emerged into the Sea of Japan shortly after 15:00 JST (06:00 UTC). Simultaneously, a cold front formed southwest of the typhoon, initiating the beginning of an extratropical transition on September 4. On September 5, after JTWC issued a final warning at 00:00 JST (15:00 UTC), Jebi was downgraded to a severe tropical storm at 03:00 JST (18:00 UTC) when it was located near the Shakotan Peninsula of Hokkaido. The storm completely transitioned into a storm-force extratropical cyclone off the coast of Primorsky Krai, Russia shortly before 10:00 VLAT (09:00 JST, 00:00 UTC). Later, the extratropical cyclone moved inland. The terrain of Khabarovsk Krai contributed to the steadily weakening trend as the system moved inland northwestward and then northward; extratropical low passed northeast of Ayan early on September 7. Jebi's extratropical remnant continued northward and then turned northeastward, before dissipating early on September 9 over the Arctic Ocean. Typhoon Jebi was the strongest storm to hit Japan since Typhoon Yancy of 1993. In total, Jebi killed 17 people and inflicted around $3.4 billion (USD). 11 deaths were reported from Japan and 6 deaths were reported from Taiwan. On September 6, a tropical depression formed near the Marshall Islands. However, operationally, the Japan Meteorological Agency (JMA) did not initiate advisories on the system until September 7. The JTWC followed suit at 03:00 UTC on September 7, and classified the system as 26W. Late on the same day, the system strengthened into a tropical storm, and the JMA named the system Mangkhut. By September 11, Mangkhut became a typhoon, and made landfall on the islands of Rota, Northern Mariana Islands. On September 12, at 3 pm Philippine Standard Time, Typhoon Mangkhut entered the PAR as a Category 5 super typhoon, and accordingly, PAGASA named the storm Ompong. The JTWC noted additional strengthening on September 12, and assessed Mangkhut to have reached its peak intensity at 18:00 UTC, with maximum one-minute sustained winds of 285 km/h (180 mph). On September 13, the Philippine Government initiated evacuations for residents in the typhoon's expected path. Late on September 14, Mangkhut made landfall on the Philippines as a Category 5-equivalent super typhoon, with 1-minute sustained winds of 165 miles per hour (266 km/h). While moving inland, Mangkhut weakened into a strong Category 4-equivalent super typhoon, and soon weakened further into a Category 2 typhoon. A large eye then appeared and the system slowly strengthened into a Category 3 typhoon, as the storm moved over Hong Kong. As Mangkhut made its final landfall, it weakened into a weak Category 1 typhoon and maintained its intensity inland with deep convection, before subsequently weakening further. Late on September 17, Mangkhut dissipated over Guangxi, China. As of September 23, at least 134 fatalities have been attributed to Mangkhut, including 127 in the Philippines, 6 in mainland China, and 1 in Taiwan. As of October 5, the NDRRMC estimated that Mangkhut caused ₱33.9 billion (US$627 million) in damages in the Philippines, with assessments continuing. 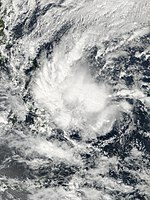 On September 8, a tropical depression formed near Batanes in the Philippines. The storm was named Tropical Depression Neneng by PAGASA, with Batanes placed under TCWS #1. By the next day, Neneng exited the PAR and became a tropical storm, with the JMA assigning the name Barijat to the storm, while TCWs were raised in the absence of the storm. Over the next 2 days, Tropical Storm Barijat moved westward across the South China Sea, reaching its peak intensity with 10-minute maximum sustained wind speeds of 85 km/h on the night of September 11. On September 13, Tropical Storm Barijat (Neneng) made landfall on the Leizhou Peninsula, near the area where Tropical Storm Son-tinh (Henry) had made landfall 2 months ago, before making a second landfall in northern Vietnam later on the same day. During the evening of September 13, Barijat became a remnant low, dissipating on the next day. Tropical Storm Barijat made a dozen landslides over Batanes, which increases the risk of major landslides and major flooding in the saturated soil influenced by this storm and later by Mangkhut (Ompong). Damages in China were at ¥50 million (US$7.3 million). On September 19, the NRL began to monitor a large tropical disturbance that formed near Chuuk in the Federated States of Micronesia. The system drifted westwards and strengthened into a tropical depression on September 20 according to the JMA, while the JTWC issued a TCFA. Trami managed to find itself in favorable conditions for strengthening and on September 21, it gained tropical storm status and was named Trami. 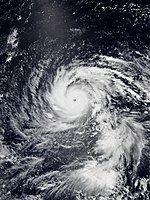 On September 22, Trami still strengthened and became a Severe Tropical Storm before strengthening to a Category 1 typhoon. On September 23, Trami, yet again in favorable conditions, continued to strengthen and became a Category 3-equivalent typhoon while undergoing a eyewall replacement cycle at the same time. Early on September 24, Trami strengthened further and attained Category 4 super typhoon status once it finished its eyewall replacement cycle. At 18:00 UTC on September 24, Trami strengthened even further and subsequently became a Category 5 super typhoon. On its route to Okinawa, Japan, Trami slowed down considerably and was almost stationary before moving north-northeastward. During this period of time, another eyewall replacement cycle that eventually failed later on, coupled with decreasing sea surface temperatures, started to slowly weaken Trami, although it still remained an organized storm. On September 30, Trami reached the most organized point of its duration after its peak, but Trami's structure started to deteriorate afterward, and the storm's winds gradually dropped as Trami resumed weakening. The typhoon made landfall over Tanabe, Wakayama Prefecture at around 20:00 JST (11:00 UTC) on September 30 as a Category 2-equivalent typhoon. The storm's structure deteriorated rapidly after landfall, and the JMA issued their last advisory on Trami on October 1. 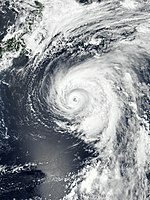 After Trami impacted Honshu, it completely transitioned into a hurricane-force extratropical cyclone and impacted the Kuril Islands and weakened to a storm-force system. Its extratropical remnants were last tracked in the Bering Sea, near the Aleutian Islands. Damage in Shizuoka Prefecture were at ¥11 billion (US$96.7 million). The JTWC gave the designation 29W next day. Remaining a weak system with an exposed low-level circulation center, the tropical depression accelerated northward and then north-northeastward until it was eventually absorbed into a developing extratropical cyclone east of Japan on September 27. In late September, a tropical disturbance formed in the waters near Pohnpei Island in the Federated States of Micronesia. The Joint Typhoon Warning Center also gave the storm, Invest 94W, a low chance of development. Over the next couple of days, the system moved westward and organized into a tropical depression on September 27, and the JMA initiated advisories on the storm, while the JTWC issued a TCFA. On September 28, the JTWC designated the system as 30W, while the JMA issued a gale warning for the system. As Tropical Depression 30W continued strengthening, the system became a tropical storm and was named Kong-rey by the JMA. On September 29, the system moved further west, found itself in favorable conditions for strengthening, and became a tropical storm. Later that day, Kong-rey strengthened into a severe tropical storm, and on September 30, the storm attained typhoon status at 03:00 UTC. Kong-rey continued strengthening, and at 18:00 UTC on October 1, Kong-rey became a Category 4-equivalent super typhoon. Early on October 2, Kong-rey strengthened into a Category 5 super typhoon. Affected by vertical wind shear, low ocean heat content and decreasing sea surface temperatures, the storm gradually weakened to a Category 3 typhoon on October 3 while undergoing an eyewall replacement cycle. Increased vertical wind shear and lower sea surface temperatures hampered Kong-rey's strength, and Kong-rey was downgraded to a tropical storm on October 4. Early on October 6, Kong-rey made landfall in Tongyeong, South Gyeongsang Province in South Korea as a high-end tropical storm, and later on the same day, Kong-rey transitioned into an extratropical cyclone, while impacting southern Hokkaido, such as areas near Hakodate. As of October 2018, 3 people have been killed by the storm, including 2 people from South Korea. Damage nationwide totaled at ₩54.9 billion (US$48.5 million). Although Kong-Rey did not make a direct landfall on Kyushu and Shikoku, its outer rainbands affected the two islands. At an area in Shikoku, rain accumlated to 300 mm. In Nagasaki, more than 12,000 families lost power; in Fukuoka Prefecture, a person died because of the rain. Agricultural damage in Okinawa and Miyazaki Prefecture were about JP¥13.99 billion (US$123 million). Unrelated to Kong-rey, Hurricane Walaka was a Category 5 hurricane at the same time Kong-rey intensified to Category 5 super typhoon intensity, marking the first time since 2005 when two tropical cyclones of Category 5 strength existed simultaneously in the Northern Hemisphere. Early on October 21, a tropical depression developed to the east of Guam and the Northern Mariana Islands, with the JMA initiating advisories on the system. Shortly afterward, the JTWC assigned the storm the identifier 31W. The system began to strengthen, becoming a tropical storm several hours later, and the JMA named the system Yutu. Favorable conditions, including low wind shear and high ocean-surface temperatures, allowed Yutu to explosively intensify on the following day, with the storm reaching severe tropical storm strength and then typhoon intensity a few hours later. From October 23 to 24, Yutu continued to organize and explosively intensify, reaching Category 5 super typhoon intensity on October 24. The typhoon continued to strengthen and displayed a healthy convective structure, while moving towards the island of Saipan. Later on the same day, Typhoon Yutu made landfall on the island of Tinian, just south of Saipan, at Category 5 intensity, with 1-minute sustained winds of 285 km/h (180 mph), becoming the most powerful storm on record to impact the northern Mariana Islands. After making landfall in Saipan, Yutu underwent an eyewall replacement cycle, which it successfully completed on the next day, and the storm strengthened back to Category 5 super typhoon status on October 26, at 15:00 UTC. On October 27, Yutu's eye became cloud-filled, indicative of weakening, and the storm weakened to a Category 4 super typhoon. On the same day, the storm entered PAGASA's area of responsibility, and Yutu was given the name Rosita by PAGASA. On October 28, Yutu quickly weakened, as ocean sea-surface heat content significantly declined. After making landfall on October 30, Yutu rapidly weakened, and when it emerged over the South China Sea, low ocean heat content and westerly wind shear caused Yutu to weaken below typhoon status. On November 2, Yutu dissipated off the coast of China. On October 25, in Saipan, the typhoon killed a woman when it wrecked the building she was staying in, and injured 133 other people, three of whom were severely injured. On Saipan and nearby Tinian, high winds from Yutu knocked down more than 200 power poles. Most of the buildings in southern Saipan lost their roofs or were destroyed, including a high school that was wrecked. On November 3, the Central Pacific Hurricane Center began monitoring a disturbance that had formed in the Central Pacific basin. This disturbance soon moved out of the basin and into the West Pacific without further development on November 6. Tracking westward, the system did not organize until late on November 18, when it reached tropical depression status on the Saffir-Simpson scale. The PAGASA named the system Tropical Depression "Samuel" and issued warnings for Mindanao and Visayas. Samuel made landfall on November 20 in the Philippines, crossing the archipelago and weakening slightly. Samuel began to restrengthen over the South China Sea, and was subsequently named "Usagi". 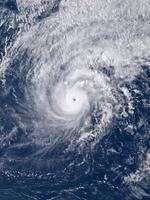 Usagi underwent rapid intensification, and became a severe tropical storm on November 21 while moving slowly. 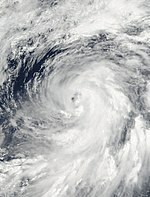 By November 22, Usagi (Samuel) intensified into a Category 1 typhoon. On November 24, Usagi weakened back to a severe tropical storm while heading to Vietnam because of the land interaction. Usagi caused one death in the Philippines, and the agricultural damage were at Php 52.2 million (US$994,000). On November 25, Usagi made landfall in Mekong Delta. The typhoon caused flooding in Ho Chi Minh City and killed three people. Losses in Vietnam were at ₫347 billion (US$15 million). A low pressure system exited the PAR on November 15. Late on November 16, a tropical disturbance formed east of Vietnam. It slowly tracked west-northwest and strengthened into a tropical-depression strength storm early on November 17. Toraji made landfall on November 18 and quickly weakened; the remnants emerged into the Gulf of Thailand, and the remnants briefly reorganized, regaining tropical-depression strength on November 20. However, as Toraji made a second landfall on the Malay Peninsula, it weakened once more and dissipated late on November 21, due to wind shear over the Strait of Malacca. Toraji caused flooding in Nha Trang, resulting in 22 dead and ₫1 trillion (US$43.2 million) in damages. On November 19, a tropical depression formed well east of the Philippines and intensified into a tropical storm soon thereafter, receiving the name Man-yi. After reaching typhoon status on November 21, Man-yi entered the Philippine basin and received the name Tomas from PAGASA. 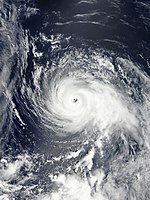 Shortly after, Man-yi intensified into a Category 2 typhoon. However, after completing an anticyclonic loop due to the influences of nearby weather systems, entering and exiting the PAR multiple times, Man-yi dipped to Category 1 status and moved into cooler waters. Succumbing to hostile conditions, Man-yi weakened into a tropical storm once more on November 25 and degenerated into a tropical depression by the end of the next day, while tracking northeast, and became an extratropical cyclone. A tropical depression formed in the Philippine Sea on December 25. It entered the PAR later that evening and the PAGASA named the significant tropical depression "Usman". Usman made its first landfall in Samar, Eastern Visayas on December 28. It passed over Palawan and other areas in the weekend. Usman did not survive the passage of the Philippines and was downgraded into a remnant low. The remnants of 35W were absorbed by an invest on December 30 which would later become Tropical Storm Pabuk. While passing over the Philippines, Usman brought heavy rain that caused several landslides, which killed 156 people, and the damage were at Php5.41 billion (US$103 million). On June 4, the JMA began tracking on a weak tropical depression that had formed northeast of Yap. However, the system was absorbed by a nearby tropical depression, which would eventually become Severe Tropical Storm Maliksi on the next day. 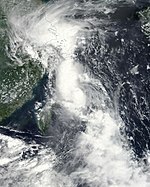 After Gaemi became extratropical, a tropical depression formed south of Hong Kong early on June 17, and dissipated over the east coast of Guangdong, China one day later. On July 16, a tropical depression developed over the South China Sea. The system remained weak and moved into Vietnam, before dissipating on the next day. On August 4, the JTWC began to track a subtropical storm that had developed just west of the International Date Line; the storm subsequently became extratropical on the next day. A tropical depression formed southeast of Okinawa on August 24; two days later, it made landfall over Shanghai and quickly dissipated over Jiangsu, in East China. The remnants associated with Hurricane Olivia entered this basin on September 19, and it developed into a tropical depression on September 21, while slowly drifting westward. Two days later, it degenerated into a remnant low again, as the JMA reported the system's dissipation. On September 25, the system's remnant energy developed into Tropical Depression 29W. On October 19, the JMA began tracking a tropical depression in the Gulf of Thailand. On October 20, the tropical depression made landfall on the Malay Peninsula and weakened into a remnant low, before moving out of the basin. A tropical depression formed over the southern portion of the South China Sea on December 31, with the JTWC designation 36W. The system intensified into Tropical Storm Pabuk on January 1, 2019, becoming the first named storm of the 2019 Pacific typhoon season. Within the Northwest Pacific Ocean, both the Japan Meteorological Agency (JMA) and the Philippine Atmospheric, Geophysical and Astronomical Services Administration (PAGASA) assign names to tropical cyclones that develop in the Western Pacific, which can result in a tropical cyclone having two names. The Japan Meteorological Agency's RSMC Tokyo – Typhoon Center assigns international names to tropical cyclones on behalf of the World Meteorological Organization's Typhoon Committee, should they be judged to have 10-minute sustained windspeeds of 65 km/h (40 mph). PAGASA names tropical cyclones which move into or form as a tropical depression in their area of responsibility located between 135°E and 115°E and between 5°N and 25°N, even if the cyclone has had an international name assigned to it. The names of significant tropical cyclones are retired, by both PAGASA and the Typhoon Committee. Should the list of names for the Philippine region be exhausted then names will be taken from an auxiliary list of which the first ten are published each season. Unused names are marked in gray. 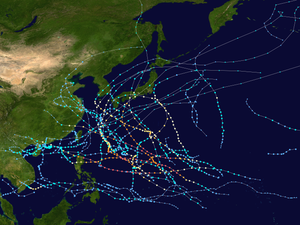 During the season 28 tropical storms developed in the Western Pacific and each one was named by the JMA, when the system was judged to have 10-minute sustained windspeeds of 65 km/h (40 mph). The JMA selected the names from a list of 140 names, that had been developed by the 14 members nations and territories of the ESCAP/WMO Typhoon Committee. During the season, the names Ampil, Jongdari and Barijat were used for the first time, after they replaced the names Bopha, Sonamu and Utor which were all retired after the 2012 and 2013 seasons respectively. After the season the Typhoon Committee retired the names Rumbia and Mangkhut from the naming lists, and their replacement names will be announced in 2020. During the season PAGASA used its own naming scheme for the 21 tropical cyclones, that either developed within or moved into their self-defined area of responsibility. The names were taken from a list of names, that had been last used during 2014 and are scheduled to be used again during 2022. The names Gardo, Josie, Maymay, Rosita, and Samuel were used for the first (and only, in the case of Rosita) time during the year after the names Glenda, Jose, Mario, Ruby, and Seniang were retired. Usman was also used for the first (and only) time ever, as following the season, the names Ompong, Rosita, and Usman were retired. They were replaced with Obet, Rosal, and Umberto for the 2022 season. This table summarizes all the systems that developed within or moved into the North Pacific Ocean, to the west of the International Date Line during 2018. The tables also provide an overview of a systems intensity, duration, land areas affected and any deaths or damages associated with the system. ^ a b c Saunders, Mark; Lea, Adam (May 11, 2018). Extended Range Forecast for Northwest Pacific Typhoon Activity in 2018 (PDF) (Report). Tropical Storm Risk Consortium. Retrieved May 11, 2018. ^ a b Saunders, Mark; Lea, Adam (July 6, 2018). July Forecast Forecast Update for Northwest Pacific Typhoon Activity in 2018 (PDF) (Report). Tropical Storm Risk Consortium. Retrieved July 6, 2018. ^ a b Saunders, Mark; Lea, Adam (August 7, 2018). August Forecast Forecast Update for Northwest Pacific Typhoon Activity in 2018 (PDF) (Report). Tropical Storm Risk Consortium. Retrieved August 7, 2018. ^ a b c d e Malano, Vicente B (January 15, 2018). January–June 2018 (Seasonal Climate Outlook). Philippine Atmospheric Geophysical and Astronomical Services Administration. Archived from the original on 2017-01-29. Retrieved January 18, 2017. ^ a b "Central region vulnerable to typhoons in 2018". Vietnam News. March 15, 2018. ^ a b Chi-ming, Shun (March 23, 2018). "Director of the Hong Kong Observatory highlights Observatory's latest developments". Hong Kong Observatory. Retrieved March 26, 2018. ^ a b July–December 2018 Malano, Vicente B (July 13, 2018). July–December 2018 (Seasonal Climate Outlook). Philippine Atmospheric Geophysical and Astronomical Services Administration. Archived from the original on 2017-01-29. Retrieved 2018-01-01. ^ Griffiths, James. "Philippines lashed by Typhoon Mangkhut, strongest storm this year". Cable News Network. Retrieved 22 September 2018. ^ "Marine Weather Warning for GMDSS Metarea XI 2017-12-30T06:00:00Z". WIS Portal – GISC Tokyo. Japan Meteorological Agency. December 30, 2017. Retrieved December 30, 2017. ^ Jhoanna Ballaran (January 1, 2018). "Storm Signal No. 1 raised in several areas as LPA turns into depression". Inquirer. ^ "Tropical Depression 01W (One) Warning Nr 001". Joint Typhoon Warning Center. January 1, 2018. Archived from the original on January 2, 2018. ^ "Tropical Depression 01W (Bolaven) Warning Nr 010". Joint Typhoon Warning Center. January 4, 2018. Archived from the original on January 4, 2018. ^ "More than 2,000 passengers stranded due to 'Agaton'". Sunstar Philippines. January 2, 2018. ^ a b "SitRep No. 13 re Preparedness Measures and Effects of Tropical Depression "AGATON"" (PDF). January 22, 2018. ^ "Tropical Storm Basyang makes landfall in Surigao del Sur". ^ "Philippines: Tropical Storm Sanba makes landfall February 13 /update 1". ^ "'Basyang' weakens after pounding Surigao". February 13, 2018. ^ a b "SitRep No. 11 re re Preparedness Measures and Effects for Tropical Storm "BASYANG"" (PDF). February 23, 2018. ^ "6yAE5Nl2l". Archived from the original on 2018-03-24. Retrieved 2018-03-24. ^ "6yBF3lHZz". Archived from the original on 2018-03-25. Retrieved 2018-03-25. ^ "6yBF7pyWZ". Archived from the original on 2018-03-25. Retrieved 2018-03-25. ^ "6yCiZiQTo". Archived from the original on 2018-03-26. Retrieved 2018-03-26. ^ "6yHP5U1lz". Archived from the original on 2018-03-29. Retrieved 2018-03-29. ^ "6yIu7LyVR". Archived from the original on 2018-03-30. Retrieved 2018-03-30. ^ "6yKn1AxSi". Archived from the original on 2018-03-31. Retrieved 2018-03-31. ^ "6yKnKMxc1". Archived from the original on 2018-03-31. Retrieved 2018-03-31. ^ "Marine Weather Warning for GMDSS Metarea XI 2018-05-10T18:00:00Z". WIS Portal – GISC Tokyo. Japan Meteorological Agency. May 10, 2018. Retrieved May 11, 2018. ^ "Tropical Cyclone Formation Alert". Joint Typhoon Warning Center. May 10, 2018. Archived from the original on May 11, 2018. Retrieved May 11, 2018. ^ "Tropical Depression 04W (Four) Warning Nr 001". Joint Typhoon Warning Center. May 12, 2018. Archived from the original on May 12, 2018. ^ "Prognostic Reasoning for Tropical Storm 04W (Four) Warning Nr 03". Joint Typhoon Warning Center. May 12, 2018. Archived from the original on May 13, 2018. ^ "Prognostic Reasoning for Tropical Storm 04W (Four) Warning Nr 05". Joint Typhoon Warning Center. May 13, 2018. Archived from the original on May 13, 2018. ^ "Tropical Depression 04W (Four) Warning Nr 008". Joint Typhoon Warning Center. May 14, 2018. Archived from the original on May 14, 2018. ^ "Marine Weather Warning for GMDSS Metarea XI 2018-06-01T18:00:00Z". WIS Portal – GISC Tokyo. Japan Meteorological Agency. June 1, 2018. Retrieved June 4, 2018. 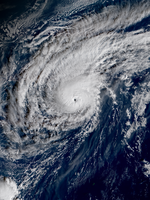 ^ "RSMC Tropical Cyclone Advisory". Japan Meteorological Agency. June 2, 2018. Archived from the original on 2018-06-02. Retrieved June 4, 2018. ^ "Tropical Depression 05W (Five) Warning Nr 001". Joint Typhoon Warning Center. June 2, 2018. Archived from the original on June 3, 2018. ^ "Tropical Storm 05W (Five) Warning Nr 015". Joint Typhoon Warning Center. June 5, 2018. Archived from the original on June 6, 2018. ^ "TS 1804 EWINIAR (1806) UPGRADED FROM TD". Japan Meteorological Agency. June 6, 2018. Archived from the original on June 6, 2018. ^ "Tropical Storm 05W (Five) Warning Nr 023". Joint Typhoon Warning Center. June 7, 2018. Archived from the original on June 9, 2018. ^ "TD DOWNGRADED FROM TS 1804 EWINIAR (1806)". Japan Meteorological Agency. June 9, 2018. Archived from the original on June 9, 2018. ^ a b c d e f g h i j k l m n o p q CMA (December 4, 2018). Member Report: China (PDF). ESCAP/WMO Typhoon Committee. ESCAP/WMO Typhoon Committee. pp. 1–2. Archived from the original (PDF) on December 4, 2018. Retrieved December 4, 2018. ^ a b c d e "RSMC Tropical Cyclone Best Track 1805 MALIKSI (1805)". Japan Meteorological Agency. July 18, 2018. Archived from the original on July 18, 2018. ^ a b "Tropical Cyclone Formation Alert". Joint Typhoon Warning Center. June 5, 2018. Archived from the original on June 6, 2018. Retrieved June 6, 2018. ^ "Tropical depression Domeng enters PAR". Philstar. June 6, 2018. ^ "Tropical Storm 06W (Maliksi) Warning Nr 001". Joint Typhoon Warning Center. June 8, 2018. Archived from the original on June 9, 2018. ^ "Tropical Storm 06W (Maliksi) Warning Nr 010". Joint Typhoon Warning Center. June 10, 2018. Archived from the original on June 10, 2018. ^ "TY 1805 MALIKSI (1805) UPGRADED FROM STS". Japan Meteorological Agency. June 10, 2018. Archived from the original on June 10, 2018. ^ "Tropical Storm 06W (Maliksi) Warning Nr 015". Joint Typhoon Warning Center. June 11, 2018. Archived from the original on June 12, 2018. ^ a b "2 dead in aftermath of Typhoon Domeng". CNN Philippines. June 11, 2018. ^ a b "Tropical Storm 07W running best track". Joint Typhoon Warning Center. Retrieved June 14, 2018. ^ "Tropical Depression 07W (Seven) Warning Nr 001". Joint Typhoon Warning Center. June 13, 2018. Archived from the original on June 14, 2018. ^ "Prognostic Reasoning for Tropical Storm 07W (Seven) Warning Nr 02". Joint Typhoon Warning Center. June 14, 2018. Archived from the original on June 15, 2018. ^ "Tropical Storm 07W (Seven) Warning Nr 004". Joint Typhoon Warning Center. June 14, 2018. Archived from the original on June 15, 2018. ^ 2018年 6月 (PDF) (Report) (in Japanese). Japan Meteorological Agency. Retrieved March 9, 2019. ^ a b "SitRep No.15 Preparedness Measures&Effects of SW Monsoon by TY Domeng & TD Ester" (PDF). NDRRMC. June 19, 2018. ^ "台風６号被害８４５８万　農林水産、大雨で斜面崩壊" (in Japanese). Ryūkyū Shimpō. June 28, 2018. Retrieved June 30, 2018. ^ "Marine Weather Warning for GMDSS Metarea XI 2018-06-28T00:00:00Z". WIS Portal – GISC Tokyo. Japan Meteorological Agency. June 28, 2018. Retrieved June 28, 2018. ^ "Marine Weather Warning for GMDSS Metarea XI 2018-07-04T00:00:00Z". WIS Portal – GISC Tokyo. Japan Meteorological Agency. July 4, 2018. Retrieved July 4, 2018. ^ a b "1 dead, 1 missing as Typhoon Prapiroon approaches Korea". Koreaherald. July 2, 2018. ^ 平成３０年台風第７号に係る被害状況等について（第７報）最終報 (pdf) (Report) (in Japanese). 沖縄総合事務局. July 4, 2018. Retrieved July 5, 2018. ^ a b "Tropical Depression 11W (Eleven) Warning Nr 001". Joint Typhoon Warning Center. July 15, 2018. Archived from the original on July 15, 2018. ^ "Prognostic Reasoning for Tropical Storm 11W (Son-Tinh) Warning Nr 07". Joint Typhoon Warning Center. July 17, 2018. Archived from the original on July 17, 2018. ^ "Prognostic Reasoning for Tropical Storm 11W (Son-Tinh) Warning Nr 08". Joint Typhoon Warning Center. July 17, 2018. Archived from the original on July 17, 2018. ^ "Prognostic Reasoning for Tropical Storm 11W (Son-Tinh) Warning Nr 12". Joint Typhoon Warning Center. July 18, 2018. Archived from the original on July 18, 2018. ^ "Tropical Storm 11W (Son-Tinh) Warning Nr 014". Joint Typhoon Warning Center. July 19, 2018. Archived from the original on July 19, 2018. ^ "Tropical Depression 12W (Twelve) Warning Nr 001". Joint Typhoon Warning Center. July 17, 2018. Archived from the original on July 18, 2018. ^ "Tropical Storm 12W (Ampil) Warning Nr 005". Joint Typhoon Warning Center. July 18, 2018. Archived from the original on July 18, 2018. ^ "Prognostic Reasoning for Tropical Storm 12W (Ampil) Warning Nr 06". Joint Typhoon Warning Center. July 19, 2018. Archived from the original on July 19, 2018. ^ "Prognostic Reasoning for Tropical Storm 12W (Ampil) Warning Nr 08". Joint Typhoon Warning Center. July 19, 2018. Archived from the original on July 20, 2018. ^ "Tropical Storm 12W (Ampil) Warning Nr 010". Joint Typhoon Warning Center. July 20, 2018. Archived from the original on July 20, 2018. ^ "Prognostic Reasoning for Tropical Storm 12W (Ampil) Warning Nr 15". Joint Typhoon Warning Center. July 20, 2018. Archived from the original on July 21, 2018. ^ "Prognostic Reasoning for Tropical Storm 12W (Ampil) Warning Nr 21". Joint Typhoon Warning Center. July 22, 2018. Archived from the original on July 23, 2018. ^ "Tropical Depression 12W (Ampil) Warning Nr 025". Joint Typhoon Warning Center. July 23, 2018. Archived from the original on July 24, 2018. ^ a b "SitRep No.35 SW Monsoon enhanced by TCs Son-Tinh, Ampil and 13W" (PDF). NDRRMC. August 9, 2018. ^ "Tropical Depression 14W (Fourteen) Warning Nr 001". Joint Typhoon Warning Center. July 21, 2018. Archived from the original on July 22, 2018. ^ "Tropical Storm 14W (Fourteen) Warning Nr 003". Joint Typhoon Warning Center. July 22, 2018. Archived from the original on July 22, 2018. ^ "Prognostic Reasoning for Tropical Storm 14W (Fourteen) Warning Nr 07". Joint Typhoon Warning Center. July 23, 2018. Archived from the original on July 23, 2018. ^ "Prognostic Reasoning for Typhoon 14W (Fourteen) Warning Nr 15". Joint Typhoon Warning Center. July 25, 2018. Archived from the original on July 25, 2018. ^ "Tropical Storm 14W (Wukong) Warning Nr 020". Joint Typhoon Warning Center. July 26, 2018. Archived from the original on July 27, 2018. ^ "bwp152018.dat". Joint Typhoon Warning Center. Retrieved July 27, 2018. ^ "Prognostic Reasoning for Tropical Depression 15W (Fifteen) Warning Nr 01". July 22, 2018. Archived from the original on July 22, 2018. Retrieved July 27, 2018. ^ "WWJP25 RJTD 231800". Japan Meteorological Agency. July 23, 2018. Archived from the original on July 23, 2018. Retrieved July 27, 2018. ^ "RSMC Tropical Cyclone Advisory 241800". Japan Meteorological Agency. July 24, 2017. Archived from the original on July 24, 2017. Retrieved July 27, 2017. ^ "Prognostic Reasoning for Tropical Storm 15W (Jongdari) Warning Nr 12". July 24, 2018. Archived from the original on July 24, 2018. Retrieved July 27, 2018. ^ "RSMC Tropical Cyclone Advisory 251200". Japan Meteorological Agency. July 25, 2017. Archived from the original on July 25, 2017. Retrieved July 28, 2017. ^ "Prognostic Reasoning for Tropical Storm 15W (Jongdari) Warning Nr 15". July 25, 2018. Archived from the original on July 25, 2018. Retrieved July 28, 2018. ^ "Prognostic Reasoning for Tropical Storm 15W (Jongdari) Warning Nr 19". July 26, 2018. Archived from the original on July 26, 2018. Retrieved July 28, 2018. ^ "RSMC Tropical Cyclone Advisory 261200". Japan Meteorological Agency. July 26, 2017. Archived from the original on July 26, 2017. Retrieved July 28, 2017. ^ "RSMC Tropical Cyclone Advisory 270000". Japan Meteorological Agency. July 27, 2017. Archived from the original on July 27, 2017. Retrieved July 28, 2017. ^ "Prognostic Reasoning for Typhoon 15W (Jongdari) Warning Nr 23". July 27, 2018. Archived from the original on July 27, 2018. Retrieved July 28, 2018. ^ "Prognostic Reasoning for Typhoon 15W (Jongdari) Warning Nr 25". July 28, 2018. Archived from the original on July 28, 2018. Retrieved July 28, 2018. ^ "平成３０年　台風第１２号に関する情報　第７３号" (in Japanese). Japan Meteorological Agency. July 28, 2018. Archived from the original on July 28, 2018. Retrieved July 28, 2018. ^ "台風第12号 (ジョンダリ) 平成30年07月29日01時50分 発表" (in Japanese). Japan Meteorological Agency. July 28, 2018. Archived from the original on July 28, 2018. Retrieved July 28, 2018. ^ "平成３０年　台風第１２号に関する情報　第９４号" (in Japanese). Japan Meteorological Agency. July 29, 2018. Archived from the original on July 29, 2018. Retrieved July 29, 2018. ^ "中央气象台03日10时30分发布台风登陆消息" (in Chinese). National Meteorological Center of CMA. August 3, 2018. Archived from the original on August 3, 2018. Retrieved August 3, 2018. ^ "Tropical Depression 16W (Sixteen) Warning Nr 001". Joint Typhoon Warning Center. July 30, 2018. Archived from the original on July 31, 2018. ^ "Prognostic Reasoning for Tropical Depression 16W (Sixteen) Warning Nr 02". Joint Typhoon Warning Center. July 30, 2018. Archived from the original on July 31, 2018. ^ "Tropical Depression 16W (Sixteen) Warning Nr 004". Joint Typhoon Warning Center. July 31, 2018. Archived from the original on July 31, 2018. ^ "Prognostic Reasoning for Tropical Depression 16W (Sixteen) Warning Nr 05". Joint Typhoon Warning Center. July 31, 2018. Archived from the original on July 31, 2018. ^ "Tropical Depression 16W (Sixteen) Warning Nr 006". Joint Typhoon Warning Center. July 31, 2018. Archived from the original on August 1, 2018. ^ "Tropical Depression 17W (Seventeen) Warning Nr 001". Joint Typhoon Warning Center. August 2, 2018. Archived from the original on August 3, 2018. ^ "Tropical Storm 17W (Shanshan) Warning Nr 003". Joint Typhoon Warning Center. August 3, 2018. Archived from the original on August 3, 2018. ^ "Prognostic Reasoning for Tropical Storm 17W (Shanshan) Warning Nr 04". Joint Typhoon Warning Center. August 3, 2018. Archived from the original on August 4, 2018. ^ 平成30年8月9日大雨（台風第13号）による被害状況について (pdf) (Report) (in Japanese). Miyagi Prefectural Government. August 10, 2018. Retrieved August 11, 2018. ^ "Tropical Depression 18W (Eighteen) Warning Nr 001". Joint Typhoon Warning Center. August 6, 2018. Archived from the original on August 11, 2018. ^ "Prognostic Reasoning for Tropical Depression 18W (Eighteen) Warning Nr 03". Joint Typhoon Warning Center. August 7, 2018. Archived from the original on August 14, 2018. ^ "Prognostic Reasoning for Tropical Storm 18W (Yagi) Warning Nr 07". Joint Typhoon Warning Center. August 8, 2018. Archived from the original on August 14, 2018. ^ "Prognostic Reasoning for Tropical Storm 18W (Yagi) Warning Nr 24". Joint Typhoon Warning Center. August 12, 2018. Archived from the original on August 14, 2018. ^ "中央气象台12日23时40分发布台风登陆消息" (in Chinese). National Meteorological Center of CMA. August 12, 2018. Archived from the original on August 12, 2018. Retrieved August 12, 2018. ^ "Tropical Storm 18W (Yagi) Warning Nr 025". Joint Typhoon Warning Center. August 12, 2018. Archived from the original on August 13, 2018. ^ a b c d e f g "Global Catastrophe Recap August 2018" (PDF). Retrieved September 7, 2018. ^ "Tropical Depression 20W (Twenty) Warning Nr 001". Joint Typhoon Warning Center. August 12, 2018. Archived from the original on August 13, 2018. ^ "Prognostic Reasoning for Tropical Storm 20W (Bebinca) Warning Nr 04". Joint Typhoon Warning Center. August 13, 2018. Archived from the original on August 13, 2018. ^ "Prognostic Reasoning for Tropical Storm 20W (Bebinca) Warning Nr 11". Joint Typhoon Warning Center. August 15, 2018. Archived from the original on August 15, 2018. ^ "Prognostic Reasoning for Tropical Storm 20W (Bebinca) Warning Nr 15 CORRECTED". Joint Typhoon Warning Center. August 16, 2018. Archived from the original on August 16, 2018. ^ a b "Nghệ An xin trung ương hỗ trợ 350 tỉ đồng khắc phục thiệt hại bão số 4". 22 August 2018. ^ "平成３０年　台風第１５号に関する情報　第３８号" (in Japanese). Japan Meteorological Agency. August 14, 2018. Archived from the original on August 17, 2018. Retrieved August 17, 2018. ^ "Tropical Storm 10E (Hector) Warning Nr 054". Joint Typhoon Warning Center. August 13, 2018. Archived from the original on August 14, 2018. ^ "Prognostic Reasoning for Tropical Storm 10E (Hector) Warning Nr 54". Joint Typhoon Warning Center. August 13, 2018. Archived from the original on August 14, 2018. ^ "Prognostic Reasnong for Tropical Storm 10E (Hector) Warning Nr 55". Joint Typhoon Warning Center. August 14, 2018. Archived from the original on August 14, 2018. ^ "Prognostic Reasoning for Tropical Storm 10E (Hector) Warning Nr 58". Joint Typhoon Warning Center. August 14, 2018. Archived from the original on August 14, 2018. ^ "Tropical Depression 10E (Hector) Warning Nr 059". Joint Typhoon Warning Center. August 15, 2018. Archived from the original on August 16, 2018. ^ ""温比亚"已登陆上海浦东 苏浙沪皖鄂豫迎强风雨" (in Chinese). National Meteorological Center of CMA. August 16, 2018. Archived from the original on August 17, 2018. Retrieved August 17, 2018. ^ Alice Yan (August 24, 2018). "Floods brought by Typhoon Rumbia devastate China's biggest supplier of vegetables". South China Morning Post. Retrieved August 25, 2018. ^ "태풍 현황과 전망" (in Korean). Korea Meteorological Administration. August 23, 2018. Archived from the original on August 23, 2018. Retrieved August 23, 2018. ^ a b "태풍 '솔릭' 제주 피해액 최종 52억원…농작물 3천354㏊ 피해" (in Korean). JTBC Newsroom. September 14, 2018. Retrieved October 15, 2018. ^ a b "台风"苏力"致吉林黑龙江损失5.5亿元". 中华人民共和国减灾部. August 27, 2018. Retrieved August 27, 2018. ^ a b Hamish Macdonald (September 3, 2018). "Dozens dead, tens of thousands displaced by flooding in North Korea: UN". NK News. Retrieved October 3, 2018. ^ "平成３０年　台風第２０号に関する情報　第５５号" (in Japanese). Japan Meteorological Agency. August 23, 2018. Archived from the original on August 23, 2018. Retrieved August 23, 2018. ^ "平成３０年　台風第２０号に関する情報　第５９号" (in Japanese). Japan Meteorological Agency. August 23, 2018. Archived from the original on August 23, 2018. Retrieved August 23, 2018. ^ "台風２０号、和歌山の農林水産被害　計２１億９千万円" (in Japanese). Sankei Shimbun. September 29, 2018. Retrieved October 23, 2018. ^ "台風２０号の農業被害、２億４千万円　滋賀県" (in Japanese). Kyoto Shimbun. October 2, 2018. Retrieved October 23, 2018. ^ 小林正典; 高橋豪; 徳永猛城; 佐藤秀男 (September 9, 2018). "京都）台風、農業被害１０億円規模　府内負傷者４２人に" (in Japanese). NHK News Web. Retrieved September 23, 2018. ^ a b 2018年 8月 (PDF) (Report) (in Japanese). Japan Meteorological Agency. Retrieved April 10, 2019. ^ "WWJP25 RJTD 250000". Japan Meteorological Agency. August 25, 2018. Archived from the original on 2018-08-25. Retrieved August 27, 2018. ^ "WWJP25 RJTD 261200". Japan Meteorological Agency. August 26, 2018. Archived from the original on 2018-08-27. Retrieved August 27, 2018. ^ "bst2018.txt". Japan Meteorological Agency. Retrieved April 12, 2019. ^ James Griffiths; Steve George; Jo Shelley (15 September 2018). "Philippines lashed by Typhoon Mangkhut, strongest storm this year". Cable News Network. Retrieved 22 September 2018. ^ a b Girlie Linao (22 September 2018). "Typhoon Mangkhut death toll hits 127". PerthNow. Retrieved 8 October 2018. ^ "At least 95 dead due to Typhoon Ompong". Rappler. 21 September 2018. Retrieved 21 September 2018. ^ 应急管理新机制助力台风"山竹"应对 (Report) (in Chinese). September 19, 2018. Retrieved September 22, 2018. ^ McKenzie, Sheena. "Typhoon Mangkhut hits mainland China, lashes Hong Kong, dozens dead in Philippines". Retrieved 16 September 2018. ^ a b "Situational Report No.55 re Preparedness Measures for TY OMPONG (I.N. MANGKHUT)" (PDF). NDRRMC. October 5, 2018. ^ "平成３０年　台風第２４号に関する情報　第１０１号" (in Japanese). Japan Meteorological Agency. September 30, 2018. Archived from the original on September 30, 2018. Retrieved September 30, 2018. ^ "台風２４号の被害額、少なくとも１１０億円　静岡県内" (in Japanese). Shizuoka Shimbun. November 15, 2018. Retrieved November 16, 2018. ^ "Prognostic Reasoning for Tropical Depression 29W (Twentynine) Warning Nr 01". Joint Typhoon Warning Center. September 26, 2018. Archived from the original on September 26, 2018. Retrieved September 28, 2018. ^ "WWJP25 RJTD 271200". Japan Meteorological Agency. September 27, 2018. Archived from the original on September 28, 2018. Retrieved September 28, 2018. ^ "WWJP25 RJTD 271800". Japan Meteorological Agency. September 27, 2018. Archived from the original on September 28, 2018. Retrieved September 28, 2018. ^ "Prognostic Reasoning for Tropical Disturbance 94W". 2018-09-25. Archived from the original on 2018-09-25. ^ "熱帶性低氣壓WP302018 #1". 2018-09-28. Archived from the original on 2018-09-28. ^ "日本氣象廳2018年西北太平洋第35號熱帶低氣壓烈風警告 #1". 2018-09-29. Archived from the original on 2018-09-28. ^ "康芮強度今晚起減弱！ 專家：近台時是中颱等級" (in Chinese). Taiwan. 2018-10-02. Retrieved 2018-10-03. ^ 郭展毓 (2018-10-06). "「康芮」登陸南韓慶南 釜山已現強風雨" (in Chinese). Hong Kong: TVBS新聞網. Retrieved 2018-10-06. ^ "Tropical Storm Kong-rey Leaves 2 Dead, 1 Missing In South Korea | The Weather Channel". The Weather Channel. Retrieved 2018-10-09. ^ "정부, 태풍 콩레이 피해복구비 2360억 지원" (in Korean). Newsis. October 30, 2018. Retrieved October 31, 2018. ^ "颱風「康妮」周六吹向日本西南部及韓國　長崎縣約1.2萬戶停電" (in Chinese). 王海如. 2018-10-07. Retrieved 2018-10-08. ^ a b "颱風「康妮」吹襲韓國　韓2人死亡1人失蹤　日1人死亡" (in Chinese). 王燕婷. 2018-10-07. Retrieved 2018-10-08. ^ "農作物の台風被害拡大　沖縄、２４号と２５号で２０億円" (in Japanese). Ryūkyū Shimpō. October 10, 2018. Retrieved October 31, 2018. ^ "農林水産被害１２０億円　台風２４、２５号で県確定" (in Japanese). Miyazaki Nichinichi Shinbun. November 16, 2018. Retrieved November 17, 2018. ^ Matthew Cappucci (October 2, 2018). "Two monster tropical cyclones are raging in the Pacific Ocean". The Washington Post. Retrieved October 14, 2018. ^ Colin Dwyer (October 24, 2018). "Super Typhoon Yutu, 'Strongest Storm Of 2018,' Slams U.S. Pacific Territory". NPR. Retrieved October 25, 2018. ^ "Category 5 Super Typhoon Yutu Now Moving Away From U.S. Territories of Saipan, Tinian After Devastating Strike". The Weather Company. October 24, 2018. Retrieved October 25, 2018. ^ "Humanitarian crisis looms after Super Typhoon Yutu flattens parts of Saipan and Tinian". Pacific Daily News. USAToday. October 26, 2018. Retrieved October 26, 2018. ^ Service, US Department of Commerce, NOAA, National Weather. "Central Pacific Hurricane Center - Honolulu, Hawai`i". www.prh.noaa.gov. Retrieved 2018-11-24. ^ a b Amazona, Roel (November 22, 2018). "1 dead, thousands displaced as 'Samuel' cuts through Samar". Pililppines News Agency. Retrieved November 22, 2018. ^ "Situational Report No.11 for Preparedness Measures and Effects of TD SAMUEL" (PDF). NDRRMC. November 24, 2018. Retrieved November 25, 2018. ^ a b "TP HCM 3 người chết do ảnh hưởng bão số 9". Báo Mới. November 27, 2018. Retrieved November 28, 2018. ^ a b "Truy trách nhiệm gây sạt lở khiến 22 người chết ở Khánh Hòa" (in Vietnamese). Báo Mới. December 6, 2018. Retrieved December 6, 2018. ^ "Tropical Depression 35W (Thirtyfive) Warning Nr 023". Joint Typhoon Warning Center. 30 December 2018. Archived from the original on 1 January 2019. Retrieved 1 January 2019. ^ Sitrep No.26 re Preparedness Measures and Effects of TD USMAN (pdf) (Report). NDRRMC. January 20, 2019. Retrieved January 20, 2019. ^ "Marine Weather Warning for GMDSS Metarea XI 2018-06-04T06:00:00Z". WIS Portal – GISC Tokyo. Japan Meteorological Agency. June 4, 2018. Retrieved June 4, 2018. ^ "Marine Weather Warning for GMDSS Metarea XI 2018-06-17T06:00:00Z". WIS Portal – GISC Tokyo. Japan Meteorological Agency. June 17, 2018. Retrieved June 18, 2018. ^ "Marine Weather Warning for GMDSS Metarea XI 2018-06-18T06:00:00Z". WIS Portal – GISC Tokyo. Japan Meteorological Agency. June 18, 2018. Retrieved June 18, 2018. ^ "bwp952018.dat". Joint Typhoon Warning Center. August 5, 2018. Archived from the original on August 6, 2018. Retrieved August 6, 2018. ^ "WWJP25 RJTD 240600". Japan Meteorological Agency. August 24, 2018. Archived from the original on 2018-08-24. Retrieved August 26, 2018. ^ "WWJP25 RJTD 260600". Japan Meteorological Agency. August 26, 2018. Archived from the original on 2018-08-26. Retrieved August 26, 2018. ^ "WWJP25 RJTD 261200". Japan Meteorological Agency. August 26, 2018. Archived from the original on 2018-08-26. Retrieved August 26, 2018. ^ "Pacific Surface Analysis 06:00 UTC 19 Sep 2018". Ocean Prediction Center. September 19, 2018. Archived from the original (GIF) on September 28, 2018. Retrieved September 28, 2018. ^ "Pacific Surface Analysis 12:00 UTC 19 Sep 2018". Ocean Prediction Center. September 19, 2018. Archived from the original (GIF) on September 28, 2018. Retrieved September 28, 2018. ^ "WWJP25 RJTD 211200 CCA". Japan Meteorological Agency. September 21, 2018. Archived from the original on September 22, 2018. Retrieved September 28, 2018. ^ "Surface Analysis 230000 UTC Sep. 2018" (PDF). Japan Meteorological Agency. September 23, 2018. Archived from the original (PDF) on September 28, 2018. Retrieved September 28, 2018. ^ "Surface Analysis 230600 UTC Sep. 2018" (PDF). Japan Meteorological Agency. September 23, 2018. Archived from the original (PDF) on September 28, 2018. Retrieved September 28, 2018. ^ "WTPQ20 RJTD 310600 RSMC Tropical Cyclone Advisory". Japan Meteorological Agency. 31 December 2018. Archived from the original on 1 January 2019. Retrieved 1 January 2019. ^ "Tropical Depression 36W (Thirtysix) Warning Nr 001". Joint Typhoon Warning Center. 31 December 2018. Archived from the original on 1 January 2019. Retrieved 1 January 2019. ^ "WTPQ20 RJTD 010600 RSMC Tropical Cyclone Advisory". Japan Meteorological Agency. 1 January 2019. Archived from the original on 1 January 2019. Retrieved 1 January 2019. ^ a b Padgett, Gary. "Monthly Tropical Cyclone Summary December 1999". Australian Severe Weather. Archived from the original on 2012-08-28. Retrieved October 1, 2013. ^ a b The Typhoon Committee (February 21, 2013). "Typhoon Committee Operational Manual 2013" (PDF). World Meteorological Organization. pp. 37–38. Archived (PDF) from the original on 2012-08-28. Retrieved October 1, 2013. ^ "CMA". www.cma.gov.cn. Retrieved 2019-03-01. ^ "PAGASA". bagong.pagasa.dost.gov.ph. Retrieved 2019-02-27. ^ a b "Global Catastrophe Recap July 2018" (PDF). Retrieved August 9, 2018. ^ "热带低压致广西海南云南损失1亿元". 中华人民共和国减灾部. July 27, 2018. Retrieved July 27, 2018. ^ News Typhoon Jongdari, July 2018 Typhoon Jongdari (pdf) (Report). Credit Suisse. August 2, 2018. Retrieved October 12, 2018. ^ "台風12号：県農林水産被害 総額10億3543万円 ／愛知" (in Japanese). Mainichi Shimbun. August 10, 2018. Retrieved October 10, 2018. ^ "台風12号の影響による農林水産業への被害について(第3報兼最終報）" (in Japanese). Chiba Local Government. September 10, 2018. Retrieved October 10, 2018. ^ 沈如峰 (September 3, 2018). "南澳神秘沙灘落海意外已釀4死 尚有1失蹤" (in Chinese). Yilan County, Taiwan: Central News Agency. Archived from the original on September 4, 2018. Retrieved September 4, 2018. ^ "Global Catastrophe Recap September 2018" (PDF). Retrieved October 12, 2018. ^ "台风"山竹"致澳门经济损失15.5亿" (in Chinese). sina. 2018-11-12. Retrieved 2018-11-12. 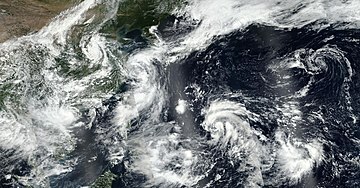 ^ "Death toll rises to 4, as Japan struck by strong typhoon". World Bulletin. October 2, 2018. Retrieved October 8, 2018. ^ "Global Catastrophe Recap October 2018" (PDF). Retrieved November 21, 2018. ^ Haidee V. Eugenio (October 26, 2018). "Humanitarian crisis looms after Super Typhoon Yutu flattens parts of Saipan and Tinian". USA Today. Retrieved January 30, 2019. ^ "Global Catastrophe Recap October 2018" (PDF). AON. AON. November 7, 2018. Retrieved November 21, 2018. Wikimedia Commons has media related to 2018 Pacific typhoon season. This page was last edited on 16 April 2019, at 04:25 (UTC).